Marc Belzunces published a cool mapping of Catalonia's Parliamentary election results on Tuesday, and it has generated enormous interest. It uses color to gauge pro-independence feeling by illustrating how people voted with respect to independence in the last elections. The most exciting part to me is how he explains how to use the map to focus independence efforts in areas with current support between 30 and 50%. It is a monumental and brilliant way of using technology. In this map, dark blue means super-majority (>50%) in favor of independence, light blue shows a majority in favor of independence, orange means majority in favor of union, and red means super-majority in favor of union. Also note that “in favor of independence” is a rough shorthand for votes for the parties with independence in their platforms, namely CiU, ERC, and CUP, while "in favor of union" is a rough shorthand for votes parties opposed to independence, that is, PSC, PP, and Cs. Of course, there is not a 100% correspondence between an individual's stand on independence and their support for any political party. Also, since ICV (eco-greens) are not clearly pro independence or union, their votes are not reflected here. The uncolored, transparent areas, which is most of the country, is where independence garners more than 50% support. Marc recommends focusing effort in those areas in which support for independence is between 30-50%, that is the green areas. Indeed, I think the most remarkable part of this whole effort is that it is yet another example of someone using publicly-available information to make a tool that others can take advantage of in order effect political change. Anyone can download Marc's KMZ map overlays and then, as he recommends, "spend a few hours playing around with them, analyzing the data and its distribution. And then making decisions about where to act." It will be interesting to see what else people come up with. Marc commented to me shortly after I originally published this article, the pro-independence areas (dark and light blue) include 70% of Catalonia's electorate. The unionist areas are 30%. 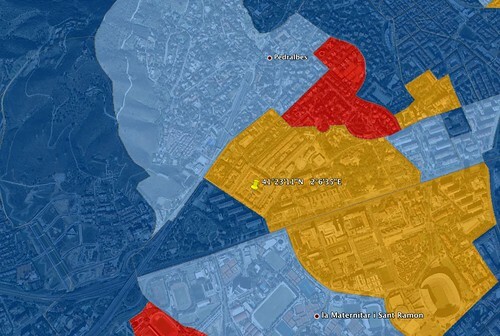 He also said that the "areas with simple majorities (light blue and orange) make up 56% of the data. These are the "battle zones". VilaWeb published news that “the US Department of Justice now has a report on Catalonia on its desk”. The report in question was written by Christopher K. Connolly, an Assistant US Attorney with the Southern District of New York of the US Department of Justice. In a footnote, he stresses that the “views expressed in this article are mine alone, and do not necessarily reflect the view of the United States Government or the Department of Justice.” I unfortunately missed this footnote at first, so my first tweets erroneously attributed the report to the US DOJ itself. My apologies. Of course, one of the most important aspects of the report is its very existence. 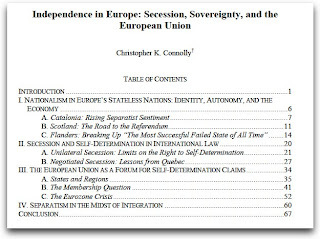 It would seem to indicate that the United States Government is taking the secessionist movements in Europe—particularly that of Scotland, Catalonia, and Flanders—very seriously. Even if the US Department of Justice didn't sign the report, the fact that one of its lawyers did is pretty significant. Connolly's summary of the events leading up to Catalonia's current political situation is accurate and balanced, if a bit cold. He doesn't explain people's frustration with current dependence on Spain and its power to control Catalonia's culture, language, and finances. But I don't think you can have it both ways. Can you claim the benefits of supporting self-determination (“we are broadminded and democratic”) without actually supporting self-determination? I think not. The EU, however, changes the calculus for advanced regions such as Catalonia: following independence, if EU membership were secured, Catalans would still enjoy access to Spanish markets and the markets of other EU member states. To disentangle these stateless nations from the EU system would be highly problematic and arguably not worth the effort especially since they would almost certainly qualify for membership as independent states. There was a definite undertone of big-country-unease throughout the report. 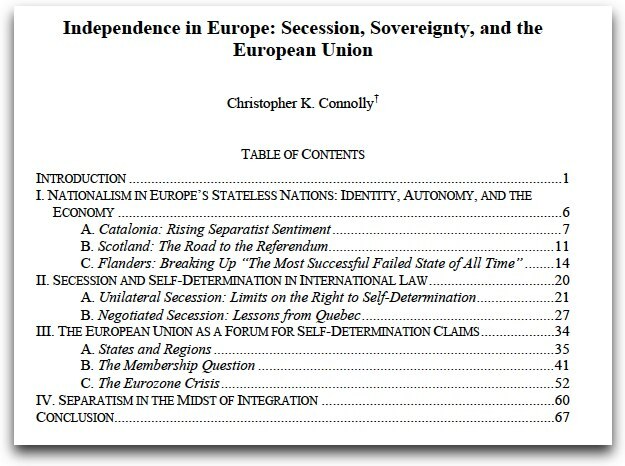 For example, Connolly cautions against offering intermediate solutions, saying that the British government runs "the risk that many Scottish voters might instead opt for independence." As if it were a bad thing. Yet the success of Flemish, Scottish, or Catalan nationalism could embolden more divisive nationalist forces elsewhere. Frankly, it frustrates me that somehow the non-ethnic, thoroughly inclusive (as Connolly himself admits) Flemish, Scottish, and Catalans should be held responsible for xenophobia in Europe. 1. States “faced with separatist movements should allow for referendums to gauge support for separation”. Spain has adamantly refused such a referendum up to now. Let's hope they're listening. regions to participate in EU policymaking." For me, too little too late. I don't think Catalonia, at least, is willing to wait. a member state.” Yes, I agree. The Catalan government is promoting, through its Diplocat office, the Twitter account @CatalanVoices, in which they will invite a different Catalanophile each week to promote and discuss the situation in Catalonia, in English. It's an initiative that already has been successful in Sweden and Scotland. The world gets smaller every day thanks to new technologies and Catalonia wants to take advantage of these opportunities and trends in order to help spread the word about the sovereignty process. The Council on Public Diplomacy of Catalonia (Diplocat), which depends on the Secretary of Foreign Affaris, has just opened a new Twitter account, @CatalanVoices, which hopes to add one more grain of sand to the pile, if you will, a new tool to the network in order to explain the reality of the situation in Catalonia and at the same time to promote its assets. Starting Monday, a Catalan, who may reside in any part of the world, or even a foreigner who lives or has lived in Catalonia—called a curator in Twitter techno-slang—will be invited to tweet during the week on their personal experiences, with the only condition being that the tweets have something to do with Catalonia. From things that happened in the past, current events, or opinions about the political process, to places they've visited, dishes they've tasted, and activities that they recommend. The only requisite is to speak about Catalonia, its culture, history, food, sports, and also to communicate some of its internal debates to the world. 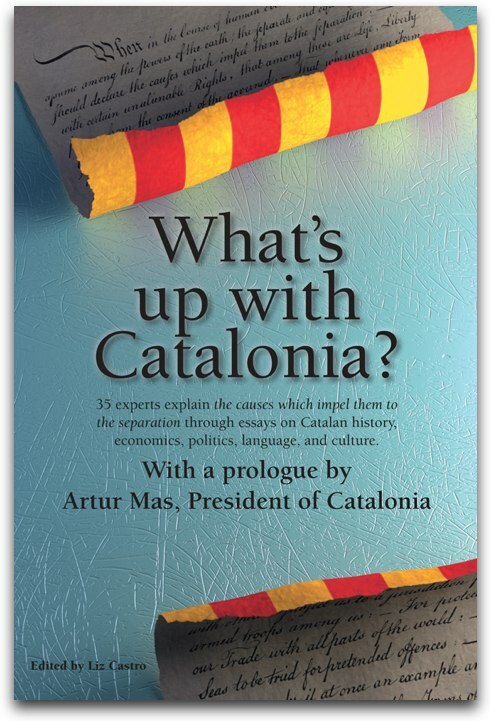 The person who will open the salvo is Liz Castro, an American publisher and promoter of the book, “What's up with Catalonia?” which deals with the reasons behind the push for sovereignty. Diplocat has already chosen five additional people of certain renown to host the account in the coming weeks, but afterwards plans to open the account to all those Catalanophiles who wish to collaborate altruistically to spread the word about Catalonia. Anyone who can express themselves correctly in English can sign up to be a curator through the form on the CatalanVoices.com website—in which they have to explain in a few paragraphs their reasons for wanting to participate. The website was set up to support the Twitter account, and will carry profiles of each of the curators. Diplocat will try to select the curators who they find most interesting, and will attempt to have curators from a diverse range of places and professions. To that end, they have also invited people to nominate curators who they think would be good candidates. The idea, which doesn't cost anything, is not new; there are several other Twitter accounts dedicated to tweeting about Catalonia in English. This one, apart from being promoted by the government, is distinguished by the fact that it is based on trends that have already been quite successful in many countries, from Australia to Pakistan. For example, the @Sweden account, begun last year by local institutions to promote tourism already has more than 66,000 followers. In Scotland, a collective of artists in favor of independence opened the @ScotVoices account just a few months ago and already have 3000 followers. And just this week, @we_are_spain also started up, it seems as a private initiative. On Thursday, in the "El perquè de tot plegat" segment of the El món a RAC1 radio program, Jordi Basté interviewed Dionisio Moreno and his client Mohamed Aziz. It is a phenomenal story, deserving of much, much more attention than it's getting, and anyone who can understand Catalan should listen. But it is not just about Catalonia, it affects mortgage law in all of Spain and is a brilliant tale of the little guy doggedly turning over every stone until they bring the big guy to justice. A system of levying execution, in reliance on notarial documents, on mortgaged or pledged property, in which the possible grounds of objection to enforcement are limited is incompatible with Directive 93/13/EEC on unfair terms in consumer contracts where the consumer cannot obtain effective legal protection, either in the enforcement proceedings themselves or in separate judicial proceedings for the assertion of the rights conferred in Directive 93/13/EC, by the court being able to order the provisional suspension of enforcement. This is a watershed for mortgage rights in Spain. It gives a judge the power to block an eviction even after foreclosure proceedings have begun. I was struck also by the fact that Dionisio Moreno got involved with the case because Aziz was a friend of Moreno's father. Moreno has done all the legal work pro bono, and has stated that he paid for many of the expenses out of his own pocket, including the trip to Luxembourg to defend the case before the European Court of Justice. At one point, he describes meeting the bank lawyers at the trial in Barcelona, after his client had already been evicted. The Bank lawyer says "What are you doing here? Isn't your client already out?" The fact that Moreno continued working on the case even after the eviction is a key part of the puzzle. And the fact that the bank lawyers completely underestimated him is another. They just expected him to give up. As Jordi Basté says, Dionisio Moreno is the Erin Brockovich of the Spanish mortgage crisis. Someone should make a movie. And meanwhile, someone should set up a legal fund for his expenses. Dionisio Moreno: "I am broke, but I am rich with sentiment"
On March 11, the Spanish Minister of Public Works signed an agreement in Brussels to promote the “Mediterranean Corridor” railway. Spain has assiduously and inexplicably refused to fund or support the connection of Barcelona and Valencia with the rest of Europe, despite the fact that 1) it has built more highspeed rail lines in Spain than any other country in the world except China, and 2) Valencia and Barcelona are the two economic powerhouses on the Mediterranean. When pushed by the European Parliament, Spain reluctantly agreed to build rail lines along the Mediterranean Corridor while at the same time insisting on a "Central Corridor" which would go straight under the Pyrenees Mountains and require huge infastructure investments as well as maintenance costs to climb and descend the differences in altitude. So people were more than just a bit worried when the press release gave an itinerary of Almería-Valencia/Madrid-Zaragoza/Barcelona-Marsella-Lyon-Turín-Milán-Verona-Padua/Venecia-Trieste/Koper-Liubliana-Budapest-Zahony. If you're any good at geography, you'll note right away that Between Valencia and Barcelona, if you pass through Madrid and Zaragoza, you've gone some 1000 km out of your way, and you won't be seeing views of the coastline along the trip. The Public Works minister then sent out a "clarifying note" that said the itinerary was the same as always—not that of the "Mediterranean Corridor" railway, but instead of the "Corridor Number 6". This line (Algeciras-Bobadilla-Madrid-Zaragoza-Barcelona) has always been the priority. Right now it has four tracks (two conventional and two high speed) almost the entire way except for the piece they're finishing up between Algeciras and Bobadilla. And they may (??) make a new normal gauge track for cargo. Meanwhile, from Alacant to Tarragona there are two conventional tracks and they'll make a third for cargo... Three total for the most used land corridor in the south of Europe. From Almeria to Valencia? All things come to those who wait. Perhaps in a few decades. From Algecires to Almeria? It's not on the table and it won't be done. This—in practice—is the agreement that was signed in October of 2010 (where they said that from Algecires to Almeria would be a good plan. There wouldn't be so much confusion if they called the Mediterranean Corridor by its true name, and what they're actually prioritizing: the Madridian Corridor. In short, there's no telling what Spain's Public Works Ministry means by "Mediterranean Corridor", since it includes a huge chunk of track that goes through Madrid. Buyer beware. Note also that no high speed connection is planned for linking Valencia and Barcelona, the two major Mediterranean ports. Talk about cutting off your nose to spite your face. I'm not sure I can even begin to unravel the bizarre twists and turns of the spying scandal that's developing in Catalonia. It's important though, because it now seems to be being used to discredit the Catalan local police force (Mossos d'Esquadra) and bring in the Spanish Police (Policía Nacional). A quick overview. 2.5 years ago (!) the head of the PP in Catalonia, Alícia Sánchez-Camacho had lunch with the ex-girlfriend of the son of the man who had been President of Catalonia for 23 years, Jordi Pujol. Supposedly the conversation (whose contents have now been protected by judicial order) included allegations from the ex that the son (Jordi Pujol Ferrusola) had smuggled suitcases of 500 euro notes to Andorra. Sánchez-Camacho did not begin any legal proceedings at the time. I can't remember if the ex-girlfriend publicized her claims at the time, but it all came to light a few weeks ago when it was revealed that a detective agency—Método 3—had recorded the conversation, by putting a microphone in a vase of flowers on the table in the restaurant where they ate. There are some that say Sánchez-Camacho was in on the recording, since in Spain it's legal to record a conversation only if the conversation takes place in public and one of the conversants knows the recording is being made. To my knowledge she has denied it. 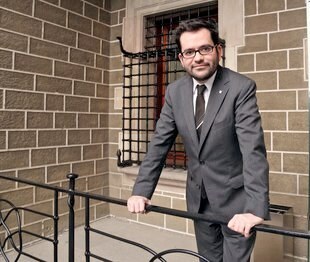 Over the weekend, the Barcelona-based conservative daily, La Vanguardia reported that the Spanish Police said that it had seen that the head of the Catalan Police, Manel Prat, (a political appointee from the CiU party) had parked his car in front of the residence of Francisco Marco, Director of Método 3 (detective agency) and picked up a woman there. Further, this was only a few hours before Marco was arrested. Alícia Sánchez Camacho then held a press conference and said that because of this information, she no longer could depend on the police protection provided to her by the Mossos d'Esquadra and that she had asked the Spanish Police to step in. She further stated that she would only accept the protection of the Mossos in the future if their director, Manel Prat, resigned. 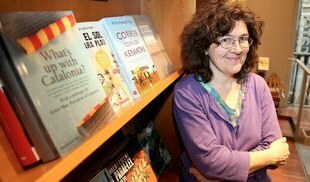 The woman who had met with Manel Prat turned out to be Mayka Navarro, a journalist with El Periódico (Barcelona newspaper). She denied that she had gotten into Prat's car in front of Marco's house, saying that she did meet with him that day but that they met 1.5 km away, on the way to grab a bite to eat. Prat confirmed her story and added that Sánchez-Camacho had asked for the Spanish Police to step in three weeks ago, without telling the Mossos. There was even an incident where the two police forces were guarding her at the same time, which could have had disastrous consequences, given that both were armed. Besides sounding like a soap opera, what's really going on here? I listened to a journalist on El Món a RAC1, Esperanza Garcia, saying "don't you think it's a little suspicious" that Navarro met with Marco just a few minutes before meeting with Prat, and just a few minutes before he was arrested." Well, I don't know, it sounds rather like what a news reporter should be doing. Even La Vanguardia's director, Pepe Antich, said as much. It does seem like a concerted effort to make Prat look bad. Further, it looks like an excuse for Sánchez-Camacho to invite the Spanish Police to do a job that doesn't belong to them, and to make it look like Catalonia can't handle its own affairs, and that it needs the Spanish Police to solve things. Meanwhile, the Spanish Minister of the Interior held a press conference today in which he said he didn't know who wrote the Police Report that was published right in the middle of Catalonia's elections in November, a report published by El Mundo newspaper which said that the candidate for the presidency had millions of euros squirreled away in Swiss bank accounts. The Swiss banks in question have denied that President Mas, former President Pujol, or Pujol's son had any accounts, deposits, safety deposit boxes, etc. in their bank. My goodness. It's just one week. Often, we have a hard time understanding the scope of the figures that we work with and we aren't conscious enough of the consequences they may have in our daily life. For that reason, it is our duty to explain to the people of this country just what is represented by the 4.5 billion euros in budget cuts that the Spanish State wants to impose by fixing a debt ceiling of 0.7% of GDP on the Catalan government. Let's look at the numbers. Let's suppose that we get rid of all of that stuff that some insist are the root of all our problems: TV3 [Catalan Television] (253M€), Catalunya Ràdio (25M€), the entire Parliament of Catalonia (55M€) and Catalonia's delegations abroad (2.5M€). Total: 317M€. We've still got 4.2B€ left to cut; we haven't even made a dent in the total figure of 4.5B€. We'll forge ahead. What else do they want us to close, hospitals? Universities? Let's imagine that we shut down, completely, the University of Barcelona, the Autonomous University of Barcelona, the Polytechnic University of Catalonia, and the University of Girona (Total: 532M€). Well, we still have 3.7B€ to go. What else should we get rid of? Entire hospitals? How about we close the hospitals of Vall d'Hebron (580M€), the Clinic (441M€), Bellvitge (300M€), Joan XXIII in Tarragona (111M€), Josep Trueta in Girona (129M€) and Arnau de Vilanova in Lleida (139M€). All shuttered. We still have 2 billion euros to cut. What else do they want us to close? Shall we get rid of the Catalan police force, the Mossos d'Esquadra? Shall we get rid of the Firefighters? Both? OK, we'll leave the country without a single policeman or firefighter: 900M€ less. But even after doing all that, we still have 1 billion euros left in additional budget cuts before we arrive at the 4.5 billion euros that the Spanish government is imposing on us. The country can not afford such cuts. We don't deserve it, and it would be unfair and inefficient. The pressure on and asphyxia of the Catalan government finances is making the holding of a referendum more urgent with every passing moment. CBS' 60 Minutes broadcast a third Catalonia-related story last night, God's Architect, about Antoni Gaudí, the man behind Barcelona's Sagrada Família Church. The images (of course!) were fabulous and the information about the architecture was quite interesting. I didn't know, for example, that the façades were meant to tell a story, that there was a Japanese sculptor who has been working there for 35 years, that the same family of architects has been shepherding the process since the 30's, and that they had managed to salvage and use the models Gaudí had created and that had been destroyed during the Spanish Civil War by anarchists. On the other hand, I found it pretty frustrating that CBS introduces Antoni Gaudí as a "Spanish architect" and never mentions the word "Catalonia" in the entire 12 minute piece. Catalonia was an integral part of Gaudí's personality and character. Imagine talking about Georgia O'Keefe without mentioning New Mexico, or Woody Allen without talking about New York. The only political background that CBS offered were the pictures of chaos from the Spanish Civil War. They did not mention that Antoni Gaudí (please, accent on the i!) was as Catalan as he was Catholic, that he was beaten by police for participating in a Catalan language literary event called the Jocs Florals (1920) and when he was 72 years old, was beaten again for refusing to speak in Spanish during a protest against the banning of the Catalan language in 1924. Alfred Bosch asserts in a recent video that the four towers on each façade represent the four stripes in the Catalan flag. By suppressing Gaudí's origins, CBS missed half the story. Even if they didn't want to delve into Catalan independence, you can't talk about Gaudí without explaining that he was from Reus, in southern Catalonia, and what it meant to be Catalan at the turn of the century. He was definitely not a Spanish architect. CBS' attempt to keep politics—and Catalonia—out of the story is in itself a political act. Last week in Barcelona, I met with @Kippelboy, aka Àlex Hinojo, Wikipedian extraordinaire, and collaborator to "What's up with Catalonia?". Between technology and Catalonia-related stuff, we have a lot in common. One of his strategies for dealing with information overflow really stuck with me. He said that he collects interesting articles and tweets throughout the week to see if what seems so urgent on one day really is worth talking about (or retweeting!) a few days later. This seemed like a great strategy and I thought I'd try it with an attempt at a weekly synthesis of the most important stories in Catalan news. Here's a first installment. Three stories got the most play this week in the Catalan press and twittosphere: the vote of the Catalan socialists in the Spanish Congress, the firing of Catalonia's Attorney General, and the declarations of the Spanish socialist Rodríguez Ibarra comparing the Catalan President to Hitler and Mussolini. On February 26, for the first time in their history, the Catalan Socialists (PSC) voted differently, and indeed against, the Spanish Socialists (PSOE). Not only that, but the vote was on whether Catalonia could hold a referendum on independence. It was frustrating to me that the PSC had to wait until they got to the Spanish Congress to vote in favor of such a thing, when they had just voted against sovereignty in the Catalan Parliament in January, but that doesn't completely minimize its significance. (And there were five PSC deputies who broke with party leadership and refused to vote against the declaration of sovereignty.) It should also be pointed out that Carme Chacón, the head of the PSC in the Spanish Congress didn't vote at all (and thus went against her party, the PSC's recommendation—while the PSC had gone against the PSOE recommendation, which is a big deal in Parliamentary politics, so they tell me, a lot different than a Democrat voting with the Republicans or vice-versa). Chacón has been locked in a power struggle for control of the PSOE leadership with Alfredo Pérez Rubalcaba for some time, and alternately hides or flaunts her Catalan background depending on where she is campaigning. But there's a lot more to it than that. The PSOE (the party of former Spanish president Felipe González) can't win a general Spanish election without winning Catalonia, and they can't win in Catalonia without the PSC. The PSC has declared itself in favor of holding a referendum on independence, but against independence itself. They say they favor a "federalist" system in Spain. Yet, there is almost no possibility of that actually happening. No Spanish party can afford to cede Catalonia any more power or financial resources without alienating the rest of the so-called autonomous regions. Advocating federalism is pie-in-the-sky politics at its most cynical. But it's clear that PSOE and PSC—both of which suffered huge losses in their most recent elections—have to figure out what they want, and how to articulate those goals to their dwindling followers. The second topic of some importance was the firing of Martín Rodríguez Sol, Catalonia's "fiscal superior". I'll admit I'm not really clear on the whole structure of the judicial system between Spain and Catalonia, so I'm not sure just how to translate "fiscal superior" (feel free to help out in the comments). My understanding is that he was Catalonia's "Attorney General" and part of the Spanish judicial system. Over the weekend (March 2-3), he had declared that it was "legitimate for Catalonia to try to consult its citizens on the political future of their country" even as he added that there was "currently no legal framework that would allow a referendum on independence". Although he softened his remarks the next day, reiterating that there was no legal way for such a referendum to take place, and that he fully supported said framework, he was called to Madrid on Tuesday where he offered his resignation to Spain's Attorney General Eduardo Torres-Dulce, who accepted it. Catalonia's President Mas declared that Rodríguez Sol's firing was a "monumental scandal" and that "freedom is under siege" in Spain and that "the democracy is on faulty ground". "In a country where freedom was respected and democracy had strong foundations, these things couldn't happen, it would be a huge public scandal." The final story I wanted to touch upon was the hullabaloo kicked up by former PSOE leader from Extremadura, Juan Carlos Rodríguez Ibarra, who clearly has not studied Godwin's law, and who publicly compared President Mas to Hitler, Mussolini and the Spanish coup leader Tejero. Ibarra's contention is that Mas' leadership of the Catalan Parliament to disregard the Spanish Constitution in order to have a democratic vote on independence is somehow an "overthrow" of the Spanish government, just like Hitler's, Mussolini's or Tejero's. It's true that Ibarra has less and less political credibility, but the fact that not a single PSOE leader stood up to disavow his remarks is perhaps most telling. So, that's a first attempt at a summary of Catalan news for this week (and a bit of the previous one since I was traveling). And I've already learned a lot. For starters, I need to grab URLs and references during the week as the news breaks. But let me know if you find it useful, and feel free to send me links and news stories that you think I should cover. It was a few weeks ago that I told a leading member of the PSC (Catalan Socialist Party): "You don't know it yet, but you're going pro-independence" It was probably a comment with too much hubris, but the answer I got was a sly smile that I clearly understood as confirmation. I have said it many times, but I'll say it again today: we're doing great, and we're moving quickly. We can't afford to forget it. When I made that comment, the vote on the Declaration of Sovereignty had already taken place and the PSC had already divided—negatively and traumatically—the Catalan Parliament. I hardly expected that just a few weeks later the referendum would cause the PSC to cast their first votes different from their Spanish socialist brethren (PSOE) in the Spanish Congress, the marginalization of José Zaragoza and removing him from the Parliamentary group leadership, and the appearance of a slew of voices calling for the breakup of PSC and PSOE—well, the imposition of PSOE over PSC. The best-read Spanish socialists know that this is a huge deal, especially for their own party. Because without the Catalan socialists, there is no possibility of a socialist government in Spain. In fact, without Catalonia, there is no possibility of a socialist government in Spain. The numbers don't add up, and therefore, clearly for that reason alone, they don't dare split up. Yet. And they are so sure about it because these Spanish socialists foresee that if PSOE runs in Catalonia instead of PSC—which is what that old dinosaur Guerra proposes—it would be a monumental disaster that would leave them much more exposed than even now, that it would undermine any pretensions they have of being a "national" party and that it would keep them from going back to what they have been up until this week. The cold calculations, therefore, look to keeping the conflict beyond the horizon, but I have no doubt that politics will lead them inexorably on. Because for PSC, the first step will be the hardest, and then they will be on their way. The vote the other day in Madrid for the Catalan socialists was like the demonstration on September 11th for the rest of the country: the day that they stepped over the line and that you can't ever come back from. 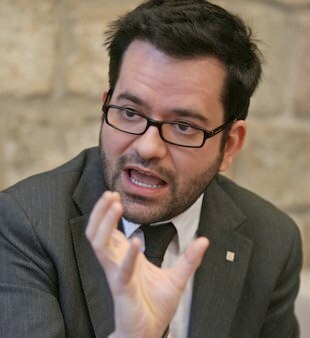 PSOE wants a meek and docile PSC. That's what they mean by "pact". But docility disappeared with the vote of those 13 MPs and the subsequently unleashed suspicions. And now, any discrepancy, no matter how small, will take on an enormous relevance. Historic. And the division will inevitably grow ever wider, exactly the way it has happened in the rest of society. No matter what they do, no matter what they say, the division will grow because the paradigm has changed. When you stop thinking about the other guy and start thinking about yourself, liberation is immediate. And it's really hard to go back to how you were. Now, finally, the most recalcitrant socialists, the ones who are most loyal to the party, will feel for themselves what many of us have felt for years: the need to respond with dignity when we are scorned, to respond with self-affirmation when we are suppressed. Zaragosa—who would've thought?—did so yesterday. And there will be plenty of opportunities to consciously embrace that which they now unknowingly think. It's not going to happen tomorrow, for sure. But it will happen, and this step forward for PSC will be a milestone in the process toward independence. Probably the last step.